A recent analysis of human-chewed remains has provided some of the most compelling evidence to date that ice age Britons engaged in cannibalistic practices. Scientists from the Natural History Museum, University College London, with the help of specialists from several Spanish universities, have discovered the presence of human tooth-marks on human bones recovered from Gough's Cave in Somerset, England. The findings, which are reported in the Journal of Human Evolution, provide what the researchers call "incontrovertible evidence for cannibalism" among Magdalenians, a hunter-gatherer culture present in western Europe toward the end of the last ice age. These particular remains date to around 15,000 years ago. Prior to this analysis, the best evidence for cannibalism came in the form of human skull caps, also found in Gough's cave (shown above). Our present analysis of the [remains] has identified a far greater degree of human modification than recorded in earlier studies. We identify extensive evidence for defleshing, disarticulation, chewing, crushing of spongy bone, and the cracking of bones to extract marrow. 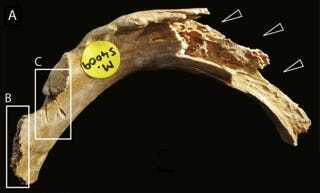 The presence of human tooth marks on many of the...bones provides incontrovertible evidence for cannibalism. In a wider context, the treatment of the human corpses and the manufacture and use of skull-cups at Gough Cave have parallels with other Magdalenian sites in central and western Europe. This suggests that cannibalism during the Magdalenian was part of a customary mortuary practice that combined intensive processing and consumption of the bodies with ritual use of skull-cups. Going forward, the researchers hope to establish whether cannibalism was a widespread practice among the Magdalenians, or simply limited to this particular region or population. Read the entire study at the Journal of Human Evolution: "Upper Palaeolithic ritualistic cannibalism at Gough's Cave (Somerset, UK): The human remains from head to toe".